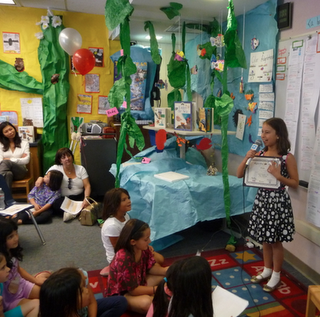 Mrs. Yollis' Classroom Blog: Los Angeles County ~ Best Elementary Blog! Our World, Our Stories blog takes top honor! The Digital Voice Awards are given out annually by the Los Angeles County Office of Education. The awards showcase quality digital projects in the hopes that other teachers will consider incorporating digital projects that enhance student learning in their own classrooms. At the end of the awards ceremony, they announce the best overall projects for elementary school, middle school, and high school. BEST OVERALL PROJECT in LOS ANGELES COUNTY! We had a red carpet Digital Voice Awards ceremony! Mrs. Yollis and class accepted the Digital Voice Award on behalf of all the wonderful teachers and classes who were members of the Our World, Our Stories blog. We were brought in live during the ceremony! It was thrilling! Mrs. Ranney and her class received a Digital Voice award too. Their post Colossal, Creative Collections won in the area of Language Arts. One of Mrs. Yollis' former bloggers, Miriam, was also honored! Her blog, Miriam's Magical Moments, was recognized for quality writing and meaningful integration of web 2.0 tools. Click here to read Miriam's excellent post about the event! Miriam delivers a terrific acceptance speech. 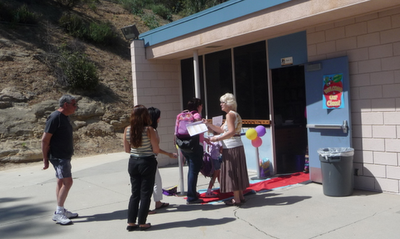 In 2009, Mrs. Yollis' Classroom Blog was named Best Elementary Project in Los Angeles County! Did you enjoy the ceremony? What elements made the Our World, Our Stories blog a winner? Well done to you all HUGE congratulation from Australia and a well deserved one too. This is like the icing on the cake to win. I feel this shows everyone the great things that you can achieve with blogging. Building and learning from all over the globe. Well, done too Miriam! you so deserve your award for you have an awesome blog which I love to visit and comment on. Keep up the awesome work everyone. In my eyes you all have been winners right from the very start. The well deserved recognition for what you have all achieved is testimony to what can be accomplished when we learn to collaborate in creative ways. This makes me wonder what great things future collaborations will bring. I have left a comment on Miriam/s wonderful blog. Considering the quality of student blogs I've visited, the judges must have had a very difficult choice.